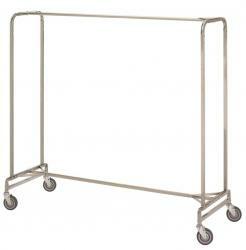 72" SINGLE GARMENT RACK 72"L x 27"W x 67"H. 175 lbs Capacity. Ultra heavy duty construction. 1" heavy gauge steel tubing. Gray 5" casters with wide stance base. Chrome plated.